This exquisite new ring uses the dazzling sparkle of cubic zirconias, the dramatic blue of created sapphires, and the irresistible beauty of genuine diamond to create a breathtaking expression oftimeless love. Expertly crafted in solid sterling silver, this extraordinary work of art is a celebration for your eyes and your heart. The large cubic zirconia centerstone is square cut tocapture the light and create sparkle. Two gorgeous trillion-cut labcreated sapphires add color and depth with their deep, rich blue hue. And for the important message of eternal love, a pair of genuine 1.2 pt. diamonds are hand-set within graceful hearts on each side of the ring. For added light, 4 round-cut zirconias cascade down the sides of the band. The setting is plated in protective layer of pure rhodium for a long-lasting shine. 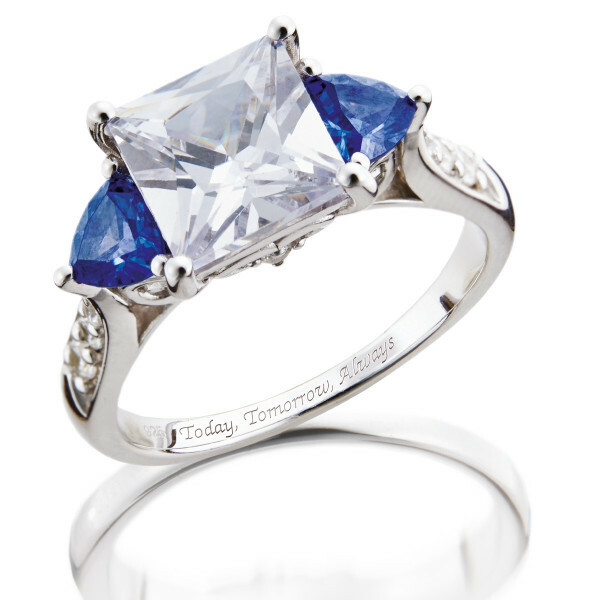 Presented in a jewelerfs ring box, the ring is engraved with the heartfelt message "Today, Tomorrow, Always" on the inside, making it a perfect gift.